If you’ve been following along on Instagram, then you know that we FINALLY moved back into our house last night! It’s been a long 3 months, but it feels amazing to be back in our (almost new) house. There will be lots of house-themed posts in the coming weeks, but today I just wanted to drop in with a quick currently post, because I’ve missed blogging in the chaos of this week, and I also want to be able to look back and remember what I was thinking in the days when we first moved back in. reading: What You Wish For by Kerry Reichs. I’m only 20 pages in so far, but hopefully I can make enough time over the next few days to knock out a bigger chunk of it. missing: TV, which sounds ridiculous, I know. We’re missing one cable in a myriad of boxes that’s keeping us from setting up our DVR. First world problems right here. wishing: That someone kind of unpacking/organizing genie existed. We’re making really good progress so far, but there’s still a looooong way to go. loving: The upgrades that we were able to do to our house! I’m really excited to share pictures of them on the blog in a couple of weeks. learning: That back and shoulder pain are just a given when you’re moving a ton of stuff and you’re closer to 30 than you are to 20.
thinking about: How amazing it will feel to have everything unpacked, organized, cleaned, and put away. I think we’ll celebrate with a nice home cooked meal. needing: Not much actually. We’re back in our house, we’ve got our 3 cats with us, and we’re all safe, healthy, and happy. I’ve got no complaints or needs at the moment. watching: Nothing right now (TV, I miss you! ), but we were getting caught up on Revenge earlier this week. Any other Revenge watchers out there?? looking forward to: Getting unpacked and enjoying our cozy “new” home! What are you looking forward to this weekend? Any tips for making unpacking easier and quicker? Ugh, good luck with all the unpacking!! But hallelujah that you are back home!! Can’t wait to see the house once you all are all unpacked. Let us know if you need anything! 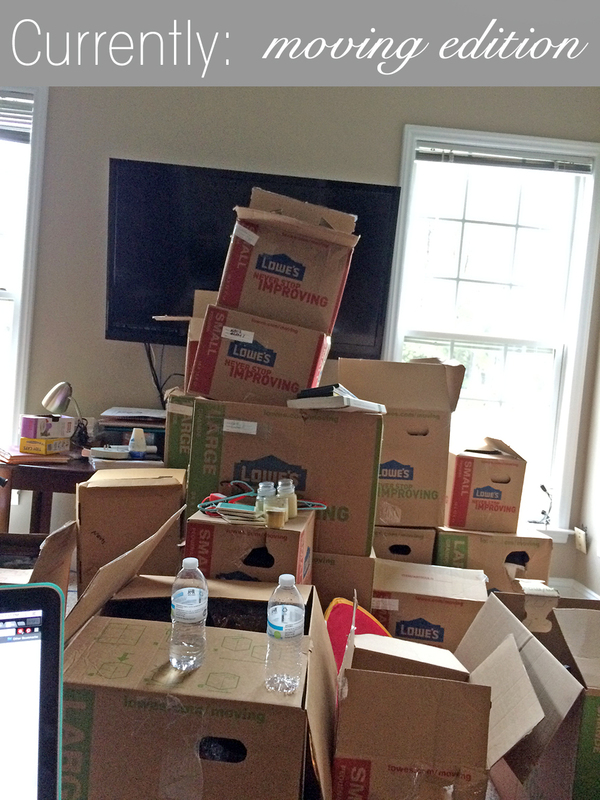 Moving – Blech! – I hate it. And, I have to do it in the next few months as well. It sounds like you’ve got such a positive outlook with it (finally being back in your house and all), that I should just shut up with my whining and complaining. Ha! I also wish for an unpacking/organizing genie, or probably just an organizing genie that would do all the chores instantly. lol. Glad to hear that you’re finally home! yes ma’am i’m a revenge watcher but after each episode i do a big SIGH and say i’m never watching another episode why does this keep going around in circles – and then i watch the next one haha! It is nice that the worst part of the moving is over! You can enjoy now the time to make your new home feel cozy! Thank you for sharing your thoughts! Greets, Moving Man Ltd.
It’s really exciting that you’re moving! Isn’t it? 🙂 You are doing great! I love the way you present your moving experience! It’s really original! Thank you! Greets!